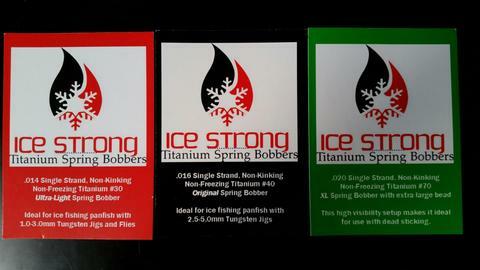 Buc’s bait will be distributing ice strong titanium spring bobber to our dealers so ask your local sport shop to carry these awesome spring bobbers. Ice fishing, as you know, is a rapidly growing sport, both recreational and competitively, and everyone is looking for the next best thing…and that’s what we have-complete with lifetime warranty! Everyone from the average Jane and Joe up to US Olympic Anglers use our products! Ice Strong Titanium Spring Bobber is the best spring ice fishing bobber on the market today…and it’s made in the USA! We are a Titanium Spring Bobber made in Michigan by Captain Matt Strong and wife Laura Strong. Capt Matt is a charter fisherman on Lake Michigan (creator of the Dreamweaver Lure Strong Fly and Strong Fly Meat Rigs), as well as a pro-ice fisherman and guide. He fishes the NAIFC tournament series and qualified for the NAIFC Championship in 2015 in Mille Lacs, MN. He also guides on Lake Gogebic in the Upper Peninsula of Michigan, spending over 100 days on the ice every year. Ice Strong Bobbers were introduced to the fishing world in 2012 as a concept idea, and then select stores in 2014. We have continued to grow, launching new products! An Ice Strong Titanium Spring Bobber is the MOST important part of an ice fishing setup. The bobber not only serves as your rod’s tip, but is a highly sensitive strike indicator. 1) The first step is to determine what jig you will be using and pick the appropriate Ice Strong Titanium Spring Bobber. 2) The next step is to attach your your bobber. It should be attached to the end of your rod tip and acts as extension of your rod. 3) The third step is to load the bobber. Thread your line through the spring bobber and tie on your favorite jig. The spring bobber will load up – meaning it should hang at an approximate 45 degree angle from your rod. 4) The final step is to get out on the ice and see all of the bites you’re been missing! You will notice, that with these highly sensitive bobbers, not only will you see the down bite, but you will see the ever-so-subtle UP bite of a crappie or finicky bluegill. Fish on fellow anglers! Tie your bobber direct to your rod tip with rod building thread and a dab of glue. 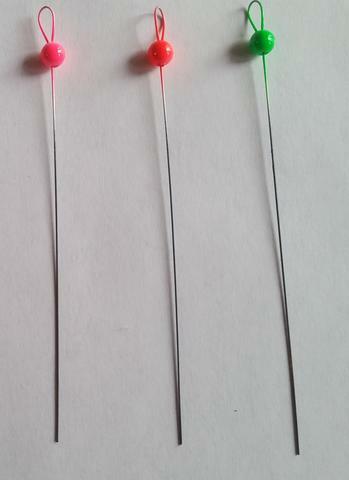 Use a dab of glue and shrink tubing over the rod tip. Shrink it down with a heat gun. Now this is a catfish!!!!! Frank Tingley stopped in yesterday to have a fish weighed and measured for master angler. We had no idea it was a monster of a fish until he opened his cooler. This fish weighed in at 35.8 lbs and measured 40 3/4 inches. The current state record is 40lbs set back in 1964 and tied a record set in 1960. Congratulations Frank on a monster of a fish! The rain from the last two days has flooded many rivers and lake levels are high. Houghton Lake has been good for crappie and bluegill. The steelhead fishing has slowed down with a few fish being caught. Suckers are running in many rivers and worms and crawlers working best. Perch fishing has been ok but wind has made it hard to fish the last few days. Manistee lake and PM lake seem to be ok for perch. Next week the fishing season opens and we will have our baitshops fully stocked. Harbor Springs: The ice is gone however the dock was not in at the public launch. Petoskey: The ice is gone but the marina did not have the docks in yet. The breakwall has seen a good number of anglers but catch rates were hit-or-miss for steelhead and coho. Rumor has it a couple brown trout caught on spawn bags. Bear River: Had higher water levels and quite a few steelhead and some suckers below the dam. Anglers are drifting spawn bags, a single egg and flies. Anglers have reported suckers up at the dam as well. Lake Charlevoix: The Ferry Beach launch was open and had a couple docks in. Traverse City: In the East Bay, lake trout were caught in deep water south of Yuba Creek. Steelhead were caught on spawn, wigglers and wax worms in the Elk River. In the West Bay, lake trout were caught when trolling and those jigging found lake herring. The perch bite was slow. Boardman River: Anglers have caught steelhead below the dam and down from Union Street Bridge. There are lots of suckers at the dam. Leland: Dredging at the harbor mouth continues and the dock is still not in at the ramp. No boats have been out but a few anglers were steelhead fishing in the harbor and in the river. Catch rates were slow but a few fish were taken on spawn. Platte Bay: Had light fishing pressure. A few anglers were fishing near the mouth of the river but had little success. There are steelhead in the lower Platte River and anglers are picking up a few. Water levels at the mouth are currently shallow and boats over 16 feet will most likely not be able to get in and out. Frankfort: Those trolling along the piers and shoreline caught brown trout on black and silver body baits. Pier anglers caught steelhead and browns on spawn or body baits. Onekama: Casting off the north breakwall was slow but will improve with the warmer temperatures. Surface water temperature was 46 degrees. Portage Lake: Bass anglers casting in the shallows and around docks caught fish in the afternoon. Perch are still hitting but anglers are searching for them and sifting through the small ones. Manistee: Surface temperatures reached 44 degrees. The restrooms will open the first week in May. A good number of perch were caught from the north pier when using minnows in the morning hours. A couple steelhead and brown trout were taken on spawn. Those trolling the shoreline caught steelhead, brown trout and lake trout. Manistee River: Continues to have good steelhead fishing although by next weekend, it should start winding down. Ludington: Surface water temperatures were about 44 degrees. The restrooms are still closed. Those trolling the shoreline continue to catch coho, lake trout and brown trout. Pier anglers caught very few steelhead and brown trout. Pere Marquette River: Still had good steelhead fishing. Anglers have about a week or so before the fishery slows down. Pentwater: Boats trolling in 5 to 20 feet caught brown trout, the occasional chinook or lake trout. Pier anglers caught brown trout with spawn near the bottom. Pentwater Lake: Those fishing on Longbridge Road caught bullhead, suckers, and the occasional channel cat on crawlers or spawn near the bottom. 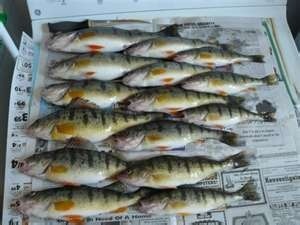 Boats fishing in 15 to 25 feet caught perch using perch rigs tipped with wax worms. Pentwater River: Had good steelhead fishing that should continue through next weekend. Cheboygan: All the docks are in at the marinas. The water levels were high and the current was strong at the Lock and dam. Steelhead were caught on spawn and wax worms at the Lock. Suckers were caught on crawlers. Cheboygan River: Shore anglers at the dam caught steelhead on spawn. Rogers City: Water temperatures were about 38 degrees. All the docks are in but nothing is open in the marina. When boats can get out, try trolling the shoreline for lake trout and Atlantic salmon. For trout, try near the bottom in 30 to 50 feet with big flashers and cowbells with spin-glo’s and flies. For salmon try bright colored body baits. Rockport: Lake trout are being caught near the bottom in 30 to 60 feet near Middle Island on flashers with flies or cowbells and spin-glo’s. Water temperatures were still cold. Those trying for Atlantic salmon had no luck. Alpena: A few walleye and smallmouth bass were caught in Thunder Bay when trolling crank baits near the mouth of the river. Walleye were caught by pier anglers casting crank baits in the waters of Lake Huron after dark. Thunder Bay River: Those drifting or floating spawn and beads caught a couple steelhead and some white suckers up near the 9th Street Dam. Oscoda: Those fishing from the pier at Au Sable River Park have caught Atlantic salmon, lake trout, and a couple steelhead when casting spoons or drifting spawn and minnows. Au Sable River: Atlantic salmon were caught by those drifting spawn or casting spoons as far upstream as the US-23 Bridge. Those targeting steelhead did best when drifting spawn, nymph eggs or black stonefly patterns between the whirlpool access and Foote Dam. White suckers were caught on spawn and worms. Those casting spoons have caught and released a few smallmouth bass near the mouth. Houghton Lake: Continues to produce crappie and bluegills in the canals. Anglers are using minnows about a foot under a bobber. There has not been anyone fishing the rest of the lake. Tawas: Those trolling in the bay were getting a few Atlantic salmon, brown trout and walleye with body baits off planer boards in 10 to 25 feet. Those heading south to Whitestone Point were getting a few more walleye. Pier anglers fishing outside the wall at the state dock caught a couple of Atlantic salmon and walleye while those fishing inside the floating docks took a couple small perch. Tawas River: Shore anglers in the lower river caught and released a few bass. A couple Atlantic salmon, several suckers, catfish and carp were also caught. Au Gres: Those trolling caught walleye off Point Lookout and Pointe Au Gres when trolling body baits. Those surfcasting at night were targeting walleye with crank baits. Au Gres River: Did not have much activity near the Singing Bridge. Marquette: Coho fishing slowed in the harbors. Those doing best were fishing the “bubblers” and taking 3 or 4 fish per trip. A couple coho and brown trout were caught when trolling near the mouth of the Chocolay River and the Carp River. Steelhead fishing in the rivers was slow. Menominee River: Anglers had to deal with some very high and fast water which kept catch rates low. Boat anglers fishing just off the mouth in the big lake caught some nice brown trout, a few walleye and a couple pike. Little Bay De Noc: All the launches are open. Perch anglers reported catches near Kipling with minnows and crawlers in 30 to 35 feet or near Hunters Point in 22 to 30 feet. The rivers are high and flowing fast. Steelhead were caught in the Day’s River from Kipling Road, north across US-2 and to the golf course. Fish were caught near the 1st Dam in the Escanaba River when fly fishing with beads or casting yarn and spawn. Manistique River: Steelhead anglers were few but catch rates were good especially in “big bass hole” which is south of the Cedar Street Bridge when fly fishing with beads, yarn and spawn. The water was high and fast so bring waders and use caution. White suckers were running and catch rates were good. Smelt anglers have just started reporting runs in the area including Black Creek and Southtown Creek. Au Train: The Brownstone launch is still unusable and the Hiawatha Forest Service has put up a fence to prevent the public from using it. Munising: Water temperatures remain cold in the mid 30’s but boat anglers have taken good catches of coho and even a few limit catches when combined with splake and brown trout when trolling spoons and stick baits. The coho averaged 16 inches. Few rainbows have been caught and no kings were observed. Pier and shore anglers report both good and bad days with a mix of coho and splake caught on spawn bags or when casting spoons or jigs. Grand Marais: Boat anglers report good action for coho with a few limit catches taken. Belly contents show they are eating smelt. A few brown trout were also caught. A chinook just over 6 pounds was caught. Pier anglers caught a few coho and the occasional steelhead ranging 18 to 25 inches. They have also reported good catches of lake whitefish on certain days with fish running 12 to 20 inches. Menominee were running 7 to 12 inches. Try spawn sacs or a single egg. The ice cap is still present on the west end of the pier but the east side of the pier is ice free all the way to the end and is fishable. The water was turbid because of gusty winds. The Sucker River is quite high due to recent rains. Shore anglers still report slow action on the Sucker River and Carpenter Creek with only a couple steelhead caught. The fish caught were not spawned out so it is possible a small run may be coming in from the lake. A few coho and lake trout were caught on spawn sacs. Two Hearted River: Has steelhead. Try spawn or wax worms. Tahquamenon River: Had a fair to good smelt run but was beginning to slow down. Anglers may still find a few fish. Other streams off Whitefish Bay have been productive as well but in much smaller numbers. Detour: All the ice is gone at Detour Passage and the docks are in. For Atlantic salmon, try trolling or long-lining with chrome crank baits along the shorelines. Small smelt runs were reported in Albany Creek off M-134 but the action will not last long. At Drummond Island, the docks are in at the DNR launch. In Maxton Bay, the Monahan Dock which is at the end of Tourist Road is open for perch fishing. Cedarville and Hessel: Some good perch catches were reported in Cedarville Bay just south of the boat launch off Meridian Street. Some 8 to 11 inch fish were caught on small minnows in 4 to 6 feet off the weed beds and around the docks. Splake were caught off the pier at the Hessel Marina. Try frozen smelt just off the bottom in 6 to 8 feet. St. Ignace: There is one dock in at the public marina however the dock is not in at the Pine River. Water levels on the Carp and Pine Rivers were high and fast. No word on smelt in the Carp River. Lake Erie: Anglers are still trolling and jigging for walleye in Brest Bay. Most are trolling stick baits or jigging bucktail jigs with minnows and twister tails. Huron River: Is starting to produce some white bass at the dam. Wamplers Lake: Anglers were catching and releasing largemouth bass on the east end in less than 8 feet, on the south end in 1 to 5 feet and near the boat launch when casting jerk baits, chatter baits, swim jigs or top water lures. Water temperatures have warmed to 54 degrees. Those next door on Sand Lake have caught bluegills and crappie in the canals on the west end in 4 feet with a white curly tail jig and black fly. Largemouth bass were caught and released on the west end in 6 to 8 feet. Detroit River: Anglers are taking walleye including some limit catches. Most are using a jig and minnow or twister tail. Dark colors like black and purple seemed to work best. Perch fishing has slowed. Panfish anglers have taken a few crappie in the canals. Lake St. Clair: Water temperatures are beginning to warm and clarity was improving. Crappie, bluegill and pumpkinseed are in the canals and marinas. Smallmouth bass have been caught in deeper water off from spring time spawning areas when using blade baits and soft plastics. Shore anglers have caught largemouth bass. The boat launch at the Clinton River Cut-Off has been cleared out allowing vessels to launch. St. Clair River: Walleye anglers were jigging and whipping mid-river and in the North Channel. The action was not fast, but there were some walleye to be caught. Lexington to Port Sanilac: Boat anglers trolling in 15 to 20 feet have caught steelhead and coho. Lake trout were found just off the bottom in 40 feet. Pier anglers casting outside the walls caught a few coho on worms, minnows and Little Cleo’s. Harbor Beach: Boats are starting to head out and have caught coho and steelhead in 15 to 18 feet or lake trout in 40 feet. Night anglers fishing the north gap caught walleye. Saginaw Bay: It appears that the spring perch runs are just about over for this year. Rivers in the area are coming down and clearing up. Much of the bay remains turbid due to runoff and high winds. Boat anglers are getting walleye off Spoils Island and off the mouth of the Kawkawlin River when vertical jigging, which still seems to be more effective than trolling. A “blue-ice” plastic minnow on a jig head seems to be the best color right now. Up the east side, trollers out of Sunset Bay Marina trying for walleye had limited success. Shore anglers fishing the Quanicassee and Sebewaing Rivers were catching carp, suckers, white bass, bowfin, and anything else that will hit a worm. Perch anglers at Bay Port and Mud Creek were getting a few but had to sort through a lot of small ones to get a couple keepers. A few sunfish were caught from the Thomas Cut when using worms and a couple crappie were caught on minnows. Saginaw River: Catfish anglers were getting a few when using shrimp in the lower river at Smith Park. Inland lakes in the region are producing crappie and bluegills in shallow waters. Crappies are hitting on minnows and the bluegills are hitting on red worms and wax worms. The perch bite is just about done. St. Joseph: Fishing pressure has been low. Most boat anglers reported inconsistent catch rates but a few managed to find a decent number of coho. The fish were very deep, well past 150 feet and were hitting on small spoons. Pier fishing was slow for coho and brown trout with only a few taken on spawn. St. Joseph River: Had some fresh steelhead using the Berrien Springs ladder. Water levels were high but were coming back down and clearing up. South Haven: Boat anglers caught a few trout and salmon in 50 feet when trolling spoons. Anglers will have to deal with some construction in South Haven and should follow the detour signs. The road to the north pier is under construction however the boat launch is open. Kalamazoo River: Water levels are coming down but water temperatures are on the rise. Cooler water up near the Allegan Dam is producing steelhead but as the water temperatures rise, that fishery will not last much longer. Grand Haven: Pier anglers caught a few brown trout when still-fishing with minnows or casting spoons. Those trolling the shoreline reported slow catch rates. Those targeting perch reported catch rates that were hit-or-miss. Grand River at Grand Rapids: Water levels are still high which makes fishing difficult. Steelhead are still being caught in the Rogue River. Grand River at Lansing: Has had very few anglers due to the high and muddy water. 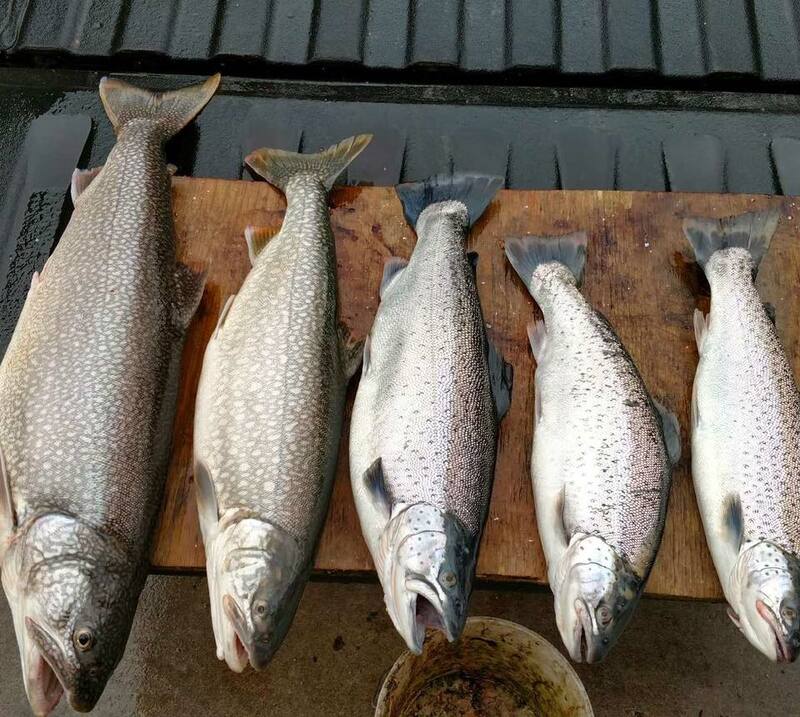 Muskegon: Pier and shore anglers reported slow catch rates for brown trout but a few were taken by those trolling bright colored spoons and body baits along the shoreline. Muskegon River: Fishing was a bit harder but anglers have managed to catch some nice steelhead when drifting spawn, casting small spoons or fly fishing. Whitehall: Pier anglers caught brown trout and steelhead on spawn near the bottom. White Lake: Perch were caught in 15 to 30 feet on dropper rigs tipped with spikes or wax worms. White River: Steelhead fishing is still going on and could last through next weekend. PM Lake at Ludington has a perch bite the last 3 days with wigglers working best. Captain Chucks has been really busy with guys heading out using wigglers and perch shiners. 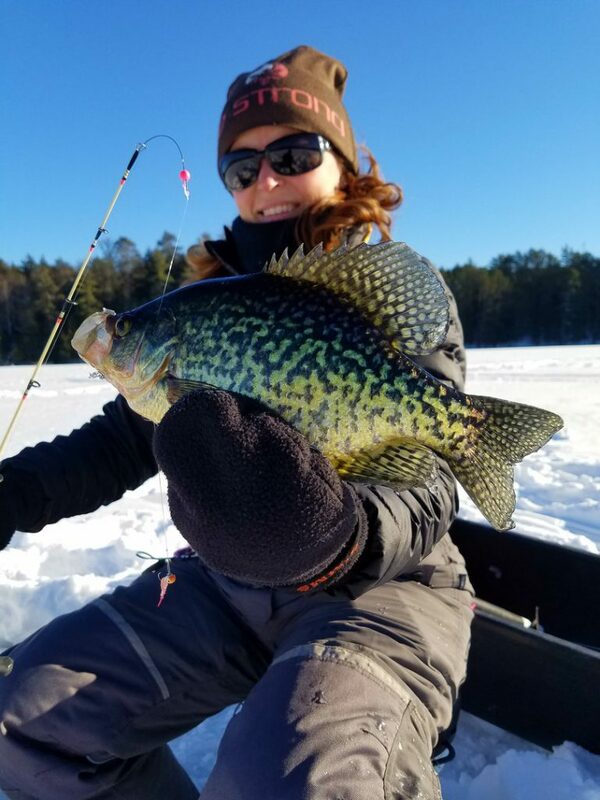 Crystal, Portage, Manistee, Big Glen, Lake Charlevoix, Green Lake, are reporting a decent perch bite. Crappie are in! Jacob Chipman from Frederick found the gills and crappie in the canals…including a 14″, master angler crappie. He said to use minnows under a pink, purple or fire tiger jig for the crappie and leaf or wax worms for the gills. They’re both hitting about 18″ from the surface. Harbor Springs: This side of the Bay was mainly ice free but the dock at the launch was not in yet. The other side of the Bay still had a lot of loose ice, so depending on wind direction it could blow back over. Petoskey: Little Traverse Bay still had quite a bit of loose ice which makes boat fishing a slim possibility. The launch at the marina does not have the dock in yet. The breakwall ice and snow is melting and anglers were fishing inside the breakwall when there was no floating ice. Catch rates were hit-or-miss but a couple steelhead and coho were caught. Bear River: Water levels were still moderately high. A fair number of steelhead were hooked between the dam and the mouth when drifting spawn bags and flies. Anglers are reminded that brown trout season is closed until the last Saturday in April. Traverse City: Most of the boating action was on the West Bay where anglers were catching plenty of perch northeast of Clinch Park when using minnows and wigglers. Though many were small, some did manage to catch fish 8 inches or larger. 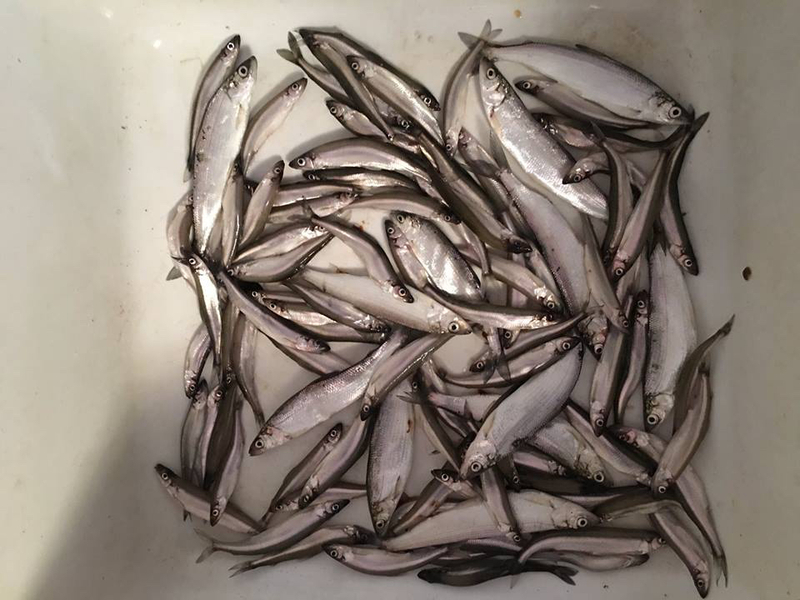 Lake herring were caught north of Bryant Park and off the M-22 launch when jigging. A couple nice trout were caught at the south end of the East Bay near Acme. Those targeting steelhead in Elk Rapids caught some fish below the dam on spawn and wax worms. Boardman River: Was slow but a couple steelhead and the occasional brown trout were still caught. Leland: A few were fishing in the harbor and the river for steelhead but only a couple were landed. Dredging at the harbor mouth was to start this week. It would be challenging to try and get a larger boat out at this point. Platte Bay: Had mainly shore anglers that were surfcasting but few fish were caught. Springtime water levels at the mouth of the Platte River are currently low, so it would be difficult for anglers to get out into Platte Bay with boats larger than 16 feet. The lower river has some steelhead. Frankfort: Pier anglers were getting the occasional steelhead or brown trout on spawn, spoons or body baits. Most of the steelhead are chrome colored. Those trolling the harbor caught brown trout when casting body baits. Betsie River: Had a lot of anglers as steelhead fishing continues. Portage Lake: Perch anglers were fishing several locations but catch rates were hit-or-miss. Minnows, worms and wrigglers were used. Manistee: Surface temperatures were about 41 degrees. All the docks are in at the launches however the restrooms and fish cleaning station were still closed. Perch were caught off the north pier when using minnows and a couple steelhead were taken when using spawn bags. Those trolling along the shoreline were getting some brown trout. Ludington: Surface temperatures made it up to 42 degrees. The restrooms and the fish cleaning station were still closed. A small number of brown trout were caught by pier anglers using spawn bags or those trolling the shoreline. Some perch were caught in Pere Marquette Lake. Pentwater: Adverse weather limited boat anglers. The water around the piers was cloudy and those fishing reported slow catch rates. Pentwater Lake: Those trolling caught the occasional steelhead or brown trout. Perch fishing was good in 10 to 30 feet using perch rigs tipped with white spikes and wax worms. Those fishing Longbridge Road caught suckers and bullhead on crawlers. 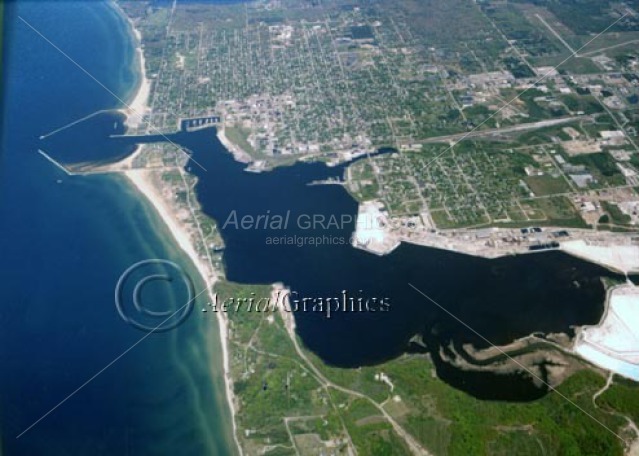 Cheboygan: The city launch and marina at the mouth of the river have the docks in. Cheboygan River: Shore anglers had some luck with steelhead at the dam and downstream when using spawn. Those that tried crank baits and spinners had no luck. Rogers City: The ice is gone and there is one dock in at the launch. When boats can get out, Atlantic salmon and lake trout should be available. Try trolling in stained waters less than 40 feet deep. In Swan Bay, bright spoons or body baits should produce some fish. Boat anglers were targeting lake trout near the bottom inside 50 feet. Try big flashers with flies or spin-glo’s. A few anglers were casting for Atlantic salmon off the wall. Try orange or chartreuse. Rockport: Anglers were casting for Atlantic salmon from the wall. The fish should show up any day now. A few boats were getting lake trout just off the bottom in 60 feet. Try big flashers with flies or spin-glo’s. Alpena: A few boat anglers were out in Thunder Bay. Those trolling for walleye have caught and released a few smallmouth bass. 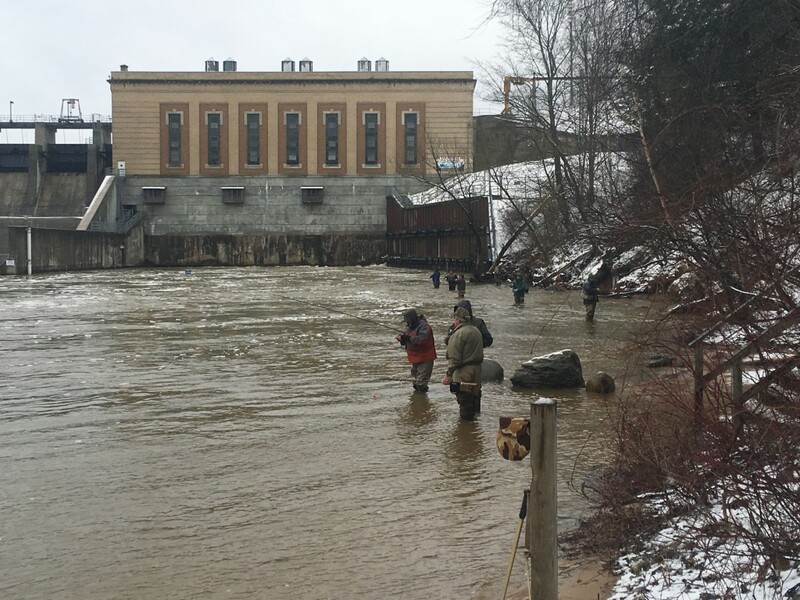 Thunder Bay River: Waters levels were elevated but anglers still caught a couple steelhead when drifting spawn near the 9th Street Dam or Hot-n-Tots from the bridges. Oscoda: Pier anglers caught lake trout when drifting or still-fishing with spawn and minnows or when casting spoons. Au Sable River: Water levels were high and turbid. Those fishing the lower river in Oscoda caught a couple steelhead on spawn but more fish were caught up near Foote Dam. Carp and freshwater drum were caught on worms. Houghton Lake: Crappie anglers are fishing the canals. Sucker fishing is starting to pick up on the Cut River near the mouth of Houghton Lake. Tawas: Pier anglers are catching brown trout, steelhead and smallmouth bass when still-fishing with minnows or casting lures. A few smaller perch were caught inside the pier. Those trolling were starting to catch walleye off Tawas Point, Alabaster and Whitestone Point. The fish were caught on body baits in 10 to 25 feet. Lake trout were caught near the reef. Tawas River: Was still producing suckers. Au Gres: Anglers caught several lake trout while fishing for walleye. Rifle River: At Greenwood Road was producing suckers. Marquette: Both the Upper and Lower Harbors are producing coho along with a few brown trout and splake. Those jigging at the “bubblers” did best with pink or white jig heads with a white twisty tail. Those trolling also caught fish with Hot-n-Tots, shad raps and small spoons for coho. Steelhead are being caught on the Carp and Chocolay Rivers. Menominee River: Anglers fishing the Turn Basin and were jigging plastics, live baits and zip lures. Brown trout were caught north and south of the mouth when trolling spoons and stick baits. Fishing pressure has been extremely heavy below the Hattie Street Dam. Little Bay De Noc: All rivers are open and flowing with water levels down some. The Bay is open but still had pack ice stacked on various shorelines. The launches that are ready for use are Rapid River, Gladstone and North Shore. The dock on the Ford River should be in this week. This should be a good week for perch anglers to try their luck. Several anglers have started steelhead fishing in the Day’s, Escanaba and Ford Rivers. Best catches were reported were in the Day’s River across US-2 and when fly fishing the Escanaba River up near the 1st Dam. Most used spawn, beads or yarn. Manistique River: The public launch is open and several boat and shore anglers have started fishing the mouth for steelhead. Fair to good catches were reported from the dam to “big bass hole” which is just south of the Cedar Street Bridge. Anglers are fly fishing with beads and yarn or casting spawn and yarn. Water temperatures were between 38 and 44 degrees. Au Train: The brownstone launch was currently not usable. A piece of cement slab at the launch pad was moved by the ice and is blocking access. Only a couple steelhead were caught in the Rock River. Munising: The ice is gone and the docks are in at the public launch. Anglers reported good catches of coho when casting or trolling with spoons. Shore and boat anglers were taking a few splake. Steelhead fishing was slow off the Anna River. Grand Marais: Good catches of coho and some nice steelhead 25 to 30 inches were reported by boat anglers. Most of the steelhead were dark, about 50% spent and appeared to be fish coming down the river. Shore anglers did poorly with very few hits off the Sucker River and Carpenter Creek area. River levels are high due to recent rains so if you are planning on fishing the mouth of the Sucker River you will want to bring waders. Two Hearted River: Had high water levels. Steelhead were spotty at best. Most roads in the area are now open. Detour: To the north, the ice is gone from the Raber Bay boat launch and the Lime Island Dock but the docks are not in yet. Look for spawning perch in 4 to 6 feet in and around old cattails and weeds with small minnows or wigglers. At Detour Village, the ice is gone at both boat launches. This is the time to start fishing for Atlantic salmon which are close to shore and chasing smelt. Try long-lining with hard crank baits that simulate smelt in 6 to 10 feet. A few anglers were targeting steelhead in Albany Creek which is about ten miles west of Detour Village under M-134 but no catches were reported. Cedarville and Hessel: The public launch at Lake Side Road has open water. Launching here allows anglers to fish for perch at the mouth of McKay Creek, and McKay Bay. The Cedarville launch off Meridian Street in town has open water. 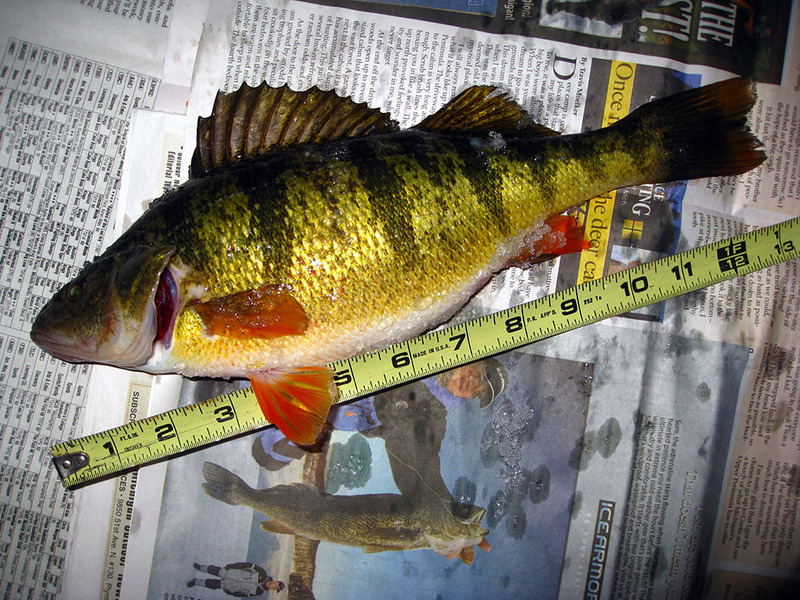 A few reports of perch have come from Cedarville Bay, south of the boat launch and around the cattails in 6 to 8 feet. Anglers were using small minnows. East winds blew the ice out of the Hessel Marina and finger docks. Splake fishing was good with small minnows and frozen smelt 20 inches off the bottom in 6 to 8 feet outside the steel breakwall. St. Ignace: Had no angler activity. There is one dock in at the public launch. The Pine River is slow and the docks are not in yet. Anglers are targeting steelhead on the Carp River using spawn but no smelt run as of yet. Black River: In Mackinac County has steelhead running and catch rates were moderate. Lake Erie: Walleye fishing in Brest Bay slowed but should pick back up. Anglers were trolling crank baits, reef runners and husky jerks. Huron River: Was still producing some steelhead for those using spawn, wax worms or flies. Wamplers Lake: In Lenawee County had anglers taking panfish near the drop-offs with limited success. Anglers were marking a number of fish that were suspended in 24 to 25 feet on the west end but could not get them to bite. They were using worms, minnows and artificial baits. Water temperatures were in the mid to high 40’s. Sand Lake which is next to Wamplers was also producing a few panfish. Detroit River: The walleye bite is improving. Anglers are using ¾ to 1 ounce jigs with minnows anywhere from 12 to 18 inches off the bottom. The cuts and canals are producing panfish. Lake St. Clair: Water temperatures have remained in the mid 40’s, but were starting to increase. Clarity still remains below average due to excessive runoff. Most species are still lethargic, but some anglers were able to catch smallmouth bass and perch. Those targeting bass did well in 3 to 5 feet when casting crank baits. Perch were caught in the canals and were hitting on minnows but worms were also working at times. Crappie and bluegills were caught in the canals and marinas when using wax worms and crawlers just off the bottom. The Clinton River was turbid and muddy and perch fishing slowed in the spillway. St. Clair River: Anglers are catching salmon off the wall at Port Huron. Smelt numbers are sparse but a couple anglers were taking a few. Anglers were beginning to catch limits of walleye in the North Channel however many fish were undersize. Lexington to Port Sanilac: Those out trolling were marking fish in 18 to 40 feet but were not catching any. Those fishing inside the harbor at Lexington managed to catch a couple coho, steelhead and perch with a crawler or minnow under a bobber. Saginaw Bay: Walleye anglers off Linwood were marking fish but had no success catching them. A few walleye were caught off the north end of Spoils Island when jigging minnows in 8 to 10 feet. Water levels near the river and the inner bay were high and muddy. A few catfish were caught at the Hot Ponds. Quanicassee to Sebewaing had poor fishing with only small fish taken. Those fishing the day use area on the Pinnebog River were taking suckers but heavy sinkers were needed due to the increased flow. Saginaw River: Water levels were high and muddy. St. Joseph: Fishing pressure was low. The few boats that have made it out struggled to find fish because the lake was churned up after the storms and strong winds. Most were slow trolling just outside the piers and along the shoreline. Pier anglers struggled as well but some did manage to catch a few whitefish and the occasional brown trout when using spawn. South Haven: Fishing pressure was low as few boats were able to get out. Those that did get out reported slow coho and brown trout fishing. Kalamazoo River: Has high water levels which is limiting fishing. The river still has a good number of steelhead. The closed tributaries also have more fish than usual because of the high water levels. Rabbit River: Has a good number of steelhead. Grand Haven: After all the rain, the water along the shoreline was muddy. Pier anglers caught a few brown trout on live minnows but the action was slow. A couple menominee whitefish were caught on wax worms or skein. Grand River at Grand Rapids: Steelhead are still being caught here and in the Rogue River however high water levels have made fishing a challenge. Use caution. Jackson County: Panfish including perch are being caught in various lakes. Muskegon: Pier and shore anglers reported slower catch rates for steelhead and brown trout. When the weather allows, boat anglers caught a few brown trout when trolling orange or green body baits along the shoreline. Muskegon River: Continues to have a good number of steelhead and some walleye but that season does not open until the last Saturday in April. In Mecosta County, there was good panfish action near Rogers Heights. Whitehall: Pier anglers caught brown trout and steelhead when still-fishing with spawn. Whitefish were also caught using wax worms or a single egg. White Lake: Anglers caught perch in 20 to 30 feet using perch rigs with wax worms. White River: Had fresh fish coming from the lake. The Soo Area Sportsmans Club has organized their annual walleye tournament on Munuscong Bay. Top prizes include 1st place $700, 2nd place $500, 3rd place Ion Auger, 4th place $300. There are lots of prizes, kids prizes, mystery weights, draw prizes, and hawg of the day challenges. It’s a great, fun-filled weekend for all ages! We are proud to host it at our place once again. Hope to see you there! Tickets are available in our tackle shop. $30 adults, $5 kids. Houghton Lake Ice Fishing Report from Lyman’s on the Lake. Dave and Dan said the walleye bite was slow the past couple of days so they’ve been targeting gills. They kept about 16 tonight (Dan caught most of them). Widow Maker tungsten jigs tipped with red spikes, waxies and wigglers were the most effective. They said the ice is still around 11″ to 14″ on the west side, but you have to be careful of the expanding auger and spearing holes. The lake should start building ice starting tomorrow night and a little snow later this week. From Lyman;s on the Lake. They said the ice is still around 11″ to 14″ on the west side, but you have to be careful of the expanding auger and spearing holes. The lake should start building ice starting tomorrow night and a little snow later this week. These kids know how to catch fish!!! Cassandra Schwager (12) from Shelby Township caught 4 pike on tip-ups. She named this one “Rod”..an impressive 25 1/2″ and over 4lbs. Rease Cale (9) from Mt Pleasant is showing off his 20 3/4″ northern he caught on a tip-up with a golden shiner. Jake Fitzpatrick (13) from Middleton is back with 3 pike and a nice perch. He was using suckers on his tip-ups. Well done, guys! Nice to see you unplug from the electronic toys and enjoy the outdoors. We still have 14 solid inches on Missaukee. Spotty slush out on the lake. Lots of slush in the shore area. The standing water is diminishing. There are still vehicles & ATV’s driving out. Heard of 3 Pike speared in the last couple days. Walleye have been biting good. No recent reports of panfish. The Hall brothers did well this morning. Great job boys! Ice Update!!! 1/25/17 Lake Mitchell and Lake Cadillac. There is about 12″ in most places. The bottom 8″ is good ice, the top 4″ is of varying hardness. Expect many wet spots on the surface with slush hiding under the fresh inch of snow. The shoreline is holding up fine for the most part, only a few isolated areas with water. Portage Lake has been great but be careful as there is some soft spots. Munuscong Bay: Dan’s Resort The ice is still holding up well despite the above-freezing temperatures today. The top is still firm packed. Sleds and quads were out today. There is still deep slush under the snowy patches. The bite was hit or miss. Some caught only a few perch while others got their limit on walleyes. Perch did well during the day while the walleyes seem to hit in late morning. Burt Lake: Ice anglers were taking a decent number of perch from Maple Bay which is on the west side of the lake. Try live minnows. Mullett Lake: Anglers were taking a few perch in front of Aloha State Park and in Scotts Bay. It’s early ice so anglers need to use caution. Traverse City: Both the East and the West Bay are open water. Boat anglers have caught perch up to 12 inches but are sorting through a lot of small ones. They were fishing in about 60 feet near Yuba and Elk Rapids in the East Bay and in front of the Boardman River in the West Bay. The lake herring bite has been good in both bays. Portage Lake: Was producing walleye and some very nice perch. Lake Cadillac: Still had ice but slush and water were making travel a little more difficult. Those finding crappie and bluegills were moving from hole to hole and using dark colored jigs with spikes. Some have caught the occasional walleye. Pike continue to hit on tip-ups. Lake Mitchell: Is also producing crappie and bluegills. Check out the coves. Those using tip-ups are taking a few pike and walleye. Manistee River: Anglers have caught some steelhead during the warm-up. Pere Marquette River: Steelhead anglers have done well when using spawn, flies and beads. Mullett Lake: Anglers are urged to use extreme caution because the ice thickness has not been uniform. Anglers may find good ice in one spot and only a couple inches in another. Most were fishing the north end near Aloha State Park and Dodge Point but fishing was slow with only a couple walleye taken. A couple pike were caught off the state park and a handful of perch were taken off the launch at Lynn Road. Higgins Lake: The ice was pulling away from the shoreline. Anglers targeting perch off the North State Park were starting to get a few smelt. Most were using minnows, wigglers or wax worms in 40 to 50 feet. Houghton Lake: Still has ice however anglers will still need to be careful and watch for existing holes that anglers have made and pike spearing holes which expanded with the warmer weather. Caution needs to be used as the pressure crack has also gotten bigger and extends about seven miles from the south side DNR Launch all the way up to Long Point. Anglers have done well for bluegills and crappie. Bluegills were hitting on wax worms, red spikes and wigglers. Crappie were hitting on jigs with minnows. Pink, purple, chartreuse and fire-tiger were good colors. For pike, anglers were using tip-ups with golden’s and suckers. The walleye bite slowed but a few were taken on rattle jigs tipped with a wiggler. Tawas: Had light fishing pressure near Jerry’s Marina, but anglers were still getting out there. Those with cameras could see a variety of fish over the artificial reef but the fish would not bite. There are vast numbers of shiners and gizzard shad down there and it’s hard to compete with Mother Nature’s smorgasbord. Nevertheless, a few pike were speared and one whitefish was caught. Tawas River: Had open water but no anglers were seen. Au Gres: Perch fishing in Wigwam Bay has slowed due to muddy water coming out of both the Rifle and Pine Rivers. Ice conditions were questionable including the area near Palmer Road where some reported four-wheelers going through the ice. Au Gres River: Most of the river had little to no fishing activity due to poor ice conditions however surf anglers at the Singing Bridge were catching good numbers of steelhead. Inland lakes in the region were getting sloppy with a couple inches of slush on top. Colder temperatures by the end of the week should shore the ice back up. Lake Gogebic: Was producing a good number of walleye. Menominee River: Most angling pressure has been at the 6th Street Slip where anglers have caught walleye, crappie, whitefish and a few perch when jigging wax worms or minnows. Little Bay De Noc: Warm temperatures and rain have worsened ice conditions throughout the area. Heavy fog and slush have limited travel. A good number of shanties were pulled before the surface refreezes. Anglers should avoid the area south of Gladstone because of dangerous ice conditions. Some were taking vehicles out on the ice however it is not recommended as several mishaps have been reported. Fishing remains slow. The better perch fishing was near Kipling with wigglers and minnows in 26 feet. There was no good spot for walleye as catches were spotty. Anglers were targeting 26 to 35 feet near Hunters Point, the Second, Third and Center Reefs. They were marking fish but finding it hard to catch them and those actually catching fish were getting undersize walleye and pike. The Escanaba Yacht Harbor also reported high numbers of small northern pike. Whitefish anglers concentrated on the Gladstone area but only a few catches were reported in 28 to 35 feet. Conditions were messy so anglers should be prepared for walking and using portable shanties. Manistique Lakes: More slush has accumulated on the ice making travel a little more difficult. Good walleye and perch fishing were reported. Munuscong Bay: Had a lot of slush on the ice. Walleye fishing has picked up and the perch fishing was good off Grassy Island. Cedarville and Hessel: Still had ice with slush on top. Hessel Bay is still the place to go for perch and splake. Anglers are also fishing Wilderness Bay for splake and some larger perch. Muskie Bay is very good for pike and fair for perch. Huron River: Had some anglers targeting steelhead. Detroit River: Is wide open. A few boats were going out but most were sticking to the canals because of all the ice coming down. Perch anglers were fishing off the docks in the marinas and in the canals near Gibraltar but were sorting through a lot of small ones to get a few keepers. Saginaw Bay: The January thaw has ruined the ice in many places. Ice conditions off the end of Linwood Road were “iffy” at best. A couple anglers tried open-water fishing in the Hot Pond but had no success. The perch action at Vanderbilt Park near Quanicassee was slow and many were leery of getting stuck near the access point as ice conditions were questionable. Sebewaing, Geiger Road, Mud Creek and Caseville all had poor ice conditions. There was no fishable ice at Port Austin, Grindstone City or Harbor Beach. Saginaw River: Boat ramps along the river were almost opened up so boat anglers may be able to get out. The Rust Avenue ramp is open and the ramp at Zilwaukee should also be ice-free. There is no safe ice anywhere along the river. The middle of the river was open and had ice and debris including tree trunks moving downstream. Tittabawassee River: Was open at Gordonville Road where boats were launching. Shore anglers were also out but catch rates were slow. Further downstream there was a lot of floating ice that can hamper fishing. The rivers have been rising constantly for a week now, and other boat ramps should be free of ice. The limited ice in the area was not safe. Many have moved back to river fishing until the lakes freeze back up. St. Joseph River: Those fishing near the dams have caught a fair to good number of walleye and the occasional steelhead. Dowagiac River: Was also producing a good number of walleye. Steelhead fishing was much slower. Kalamazoo River: Had elevated water levels which made fishing more difficult. Grand River at Grand Rapids: Is producing some steelhead and a few walleye up near the Sixth Street Dam. Rogue River: Anglers caught steelhead with a jig and wax worm. Lyman’s on the Lake has their Shanties Out on Hought! Houghton Lake Ice Report 1.02.17 Our shanties are now on the ice and ready to rent. Most of the lake is 5″ to 8″, but there are thinner spots as well, so don’t assume your next step is necessarily safe. There are also a few pressure cracks where its not safe to cross. Stop in and see us before you go out for the latest report. (231) 839-0440 had this monster bought in today from the Lake.This just in & measured by us- 43″ Northern! Good job Jake & Jordan! Pilgrims Village Fishing Shop added 4 new photos. Ice update! Lake Mitchell and Lake Cadillac 12/28/16. What a difference a couple of days makes. All of the snow is melted off the top and refroze. There seems to be a good 4″ to 7″ of ice near all the public access sites. I checked over by Thirsty’s gas station, Big cove, Kenwood Park and the city boat launch. Ice fishing is fairly solid here in the Ludington area. Jeff took this 32″ pike with a spear yesterday evening. Ice off of Wilson Hill is about 6″. We are open 7 days a week at the lake Leelanau narrows resort for live bait and tackle! Saginaw Bay: the ice was not safe. Walleye Pro Mark Martin is holding an Ice Fishing Vacation/School on Houghton Lake January 8th-11th! Mark and his pro staff are outstanding teachers and his students have a lot of fun. Mark still has a few spots left, but they won’t last. I have been all around the state and have found lakes that go from 5 inches down to 1 inch in a few feet, the snow really hurt the ice but this warm up should help get the snow down so it can freeze. Have heard of many people falling though trying to get out, a few are fishing but is it worth the risk. There was a rumor that Higgins had ice and it is wide open so you need a boat to fish it. White Lake by Whitehall was the only lake I saw shanties on as the snow missed there so they had ice but the warm weather will make it questionable. The Upper got hammered even worse with snow and most reports are slush and unsafe ice. They have been fishing on Wixom and Sanford lake in the shallow bays and Canals with gills and crappie biting. Muddy Bay has been hit hard as it is shallow also they do not have the snow like many other places. Chappel Dam Grocery by Gladwin says a few have been out on Wiggins and Pratt with 3 to 5 inches. Houghton Lake Ice Report 12.21.16. The ice is being stubborn and unpredictable. 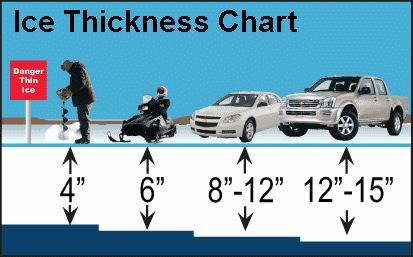 Ice thickness ranges from 8″ to 2″. There are guys fishing, but they have been staying fairly close to shore. The south shore weed bed can be fished to about 200 – 300 yards out, but you need to check as you go. Areas of east bay, north shore by Flint Rd and in the canals can be fished. No one is traveling by quad or sled yet. Current ice conditions on Lake Missaukee as of 12:30pm today- 2″ of ice, 1″ of water, 2″ of foamy ice. 75 yards out, 2 blows with a spud goes through. It is worse in the areas where the snow is sitting. Again, this is not safe! If you choose to go, please use extreme caution. Conditions on both Lakes Mitchell and Cadillac are very inconsistent. Some places that I was yesterday now have some dark spots bleeding through the snow. If you were planning on coming up from out of town you would be better off waiting until we have more consistent conditions. Everybody be safe this weekend. Has a full supply of live bait and Fishing was slow today for the most part. But the ice conditions on upper Hamlin are looking good. Most spots have a solid 6″ of ice. Indian Pete bayou has a 5 to 6″ of ice, there is a few spots around the edges that are questionable but for the most part it is good solid ice. Fishing should improve after this front has moved through. We currently have 3 inches of ice at the end of our docks and we are starting to see people fishing in front of the old Wesley’s Marina. Just a reminder that we are open 5:30am – 5:30pm, Friday- Sunday, 7:00am – 5:30pm Tuesday – Thursday. Most of the inland lakes in this region did not have safe ice. Those anxious to head out would be wise to fish in shallow waters only. With the deep snow cover and strong winds, ice formation will not be uniform. Many of the inland lakes in this region are being reported as too early for safe ice especially with the amount of snow cover over the last week. Grand Lake: A few anglers were testing the ice however the DNR cannot stress enough the importance of ice safety and ask anglers to be very cautious. Higgins Lake: Was all open water except for a little ice around the shoreline. Houghton Lake: Has ice but it is not uniform by any means especially with 6 to 8 inches of snow on top. The better ice was close to shore in the shallows. A few pike have been taken on tip-ups with blues or golden shiners. Ice is forming on the inland lakes however areas in the snow-belt have received quite a bit of snow. That snow will insulate the ice and slow the freezing process. Those heading out were fishing in shallow waters only. Be careful near inlets and outlets. Some limits of panfish were reported by those fishing in shallow water. Lake Cadillac: Had a few anglers out on the west end of the lake. It might be a good idea to avoid the deeper waters at this time. Lake Mitchell: A few ice anglers were targeting bluegill and crappie in Big Cove. Lake Missaukee: Had a few ice anglers fishing in shallow waters. Thin ice cover was reported in some of the sheltered bays and along the shoreline of Lake Superior. Inland lakes in the western end had ice starting to form but caution is advised. On the east end, lakes were ice and snow covered. Many have tracks where anglers have tested the ice. Some have ventured out on a few of the larger lakes such as Manistique and Brevoort Lake but caution needs to be used. A few pike have been caught. Recent snowfall has made foot travel on the ice more challenging. Lake Erie: A few ice anglers were jigging for walleye in 16 to 18 feet in Brest Bay. Use extreme caution. Those fishing near the mouth of the Huron River caught bluegills and one steelhead in Lake Point Marina. Ice anglers in the Metro Park Marina caught yellow perch on minnows. Huron River: Was still giving up the occasional steelhead. Detroit River: Had a few anglers ice fishing in Airport Bay. Lake St. Clair: Anglers hitting the canals and marinas had mixed results for panfish and yellow perch however a few nice catches of large yellow perch and crappie were reported. Those fishing the marinas in St. Clair Shores had success. Ice has begun to form in the main lake however conditions are day-to-day and are very unpredictable with the recent high winds and current. Saginaw Bay: Had a few anglers fishing from shore ice only off the Pinconning Park, a couple roads south of there and off the end of Linwood Road. These anglers are perch fishing in just a couple feet of water. Shore anglers were targeting perch in Sebewaing but most of the fish were small. Many anglers will fish in a pair of neoprene waders this time of year so if they fall through in shallow water they don’t get wet. Pine River: Largemouth bass and black crappie were caught in Alma and St. Louis. Most were using stick baits and surface lures. Kalamazoo River: Steelhead anglers did well trolling silver and green Hot-n-Tots. Hutchins Lake: In Allegan County had a few ice anglers. Some did well with demon glows and spikes near the channel. Thornapple Lake: In Barry County was producing some fish for ice anglers however caution needs to be used. Branch County: Anglers were taking limit catches of bluegill at Cemetery Lake. Tip-ups were showing up on Messenger Lake. Please use caution. Muskegon River: Continues to produce some steelhead. Water temperatures were in the mid 30’s. Skim ice was found along the shoreline. Fishing has been horrible this week with very few fishing as snow, wind and freezing rain have kept most souls home waiting for better days. It is a challenge to fish from a boat or shore. Elevated water levels on many rivers will make fishing difficult. There was almost a foot of snow in Gaylord today with Otsego Lake still had ice. As I look out the window it is snowing hard in Northern Michigan. Some inland lakes were still ice covered. There is too much to launch a boat but yet not enough to call it safe ice. It needs to warm up and stay that way so the lakes will open up. Harbor Springs: The dock was not in at the boat launch. There were no pier anglers as the area received heavy snow once again. Petoskey: The dock is not in at the boat launch. Ice is not a problem in Little Traverse Bay this year but skim ice was still forming in the marina especially at night. Angling effort was concentrated at the mouth of the river down to the beach, and on the breakwall. Anglers caught steelhead on spawn bags and wax worms. Early morning seems best. The Bear River is very high right now. There is not much effort at the dam or downstream because of the fast water. Traverse City: Blowing snow and cold windy days have kept most boats off both the East and the West Bay. Those trout fishing had success on the pier off Sunset Park on the West Bay and below the dam in Elk Rapids on the East Bay. Boardman River: Anglers targeting steelhead had success between the Union Street Dam and the mouth. Frankfort: The ice is gone and the boat ramps are clear but the docks were not in yet. A couple steelhead were caught off the north pier when using spawn. Onekama: Had no fishing activity. The pier and boat launch were ice free and the city has their dock in. Portage Lake: Had no anglers. Both boat launches are clear of ice and the city has their dock in. Manistee: Water temperatures were about 43 degrees. Anglers have picked up the occasional steelhead around the piers. Manistee Lake: The perch numbers have dropped but anglers were still picking up fish near Penny Park. Big Manistee River: Water levels were still on the high side and running 42 to 44 degrees. Steelhead are moving with a good number of fish up near Tippy Dam. Pink has been a hot color. The lower end of the river has been slow because of the high and muddy water. Those looking for suckers have done well when using crawlers near Bear Creek. Ludington: The bay was ice free. The docks are in but few anglers were out. Pentwater: Pier anglers are targeting steelhead and brown trout as the weather permits. Pentwater Lake: Steelhead were being caught in the channel. Keweenaw Bay: Steady snowfall, high winds and cold temperatures have produced a lot of frozen slush in the bay. Angler participation has been down for a few days. Before the return of winter, fishing was good for some and not so good for others. Those using mini planer boards with body baits like shad raps or plain rapalas did well 15 to 25 feet down in 20 to 70 feet near Sand Point. Orange was the hot color. Those fishing between the Baraga Marina and the L’Anse Marina have only picked up the occasional coho. No chinook have been seen or reported. Steelhead were caught in the Falls River but the action was hit-or-miss. Those fishing off the Rock Dock in L’Anse have picked up steelhead and coho while the Sand Point anglers have only picked up a couple coho. Menominee River: The upper river from the Hattie Street Dam down to Stephenson Island was still producing a good number of walleye along with the occasional brown trout and steelhead. Suckers were up near the dam. Water levels were high and muddy. Little Bay De Noc: Conditions improved however because of the cold nights, some ice was still hanging on near Kipling. The Ford River and the Gladstone launch are the only ones up and running. The Escanaba Yacht Harbor was still partially iced over. A boat could be launched at the Rapid River but the dock is not in and the asphalt has buckled. The gate has been opened at the North Shore launch but no docks were in. Steelhead anglers reported catches in the Whitefish, Tacoosh, Day’s and Ford Rivers. A few boats have gone after brown trout just south of the Ford River but no reports came in. Big Bay De Noc: The only usable launch is at Ogontz. The area was ice free and the dock is never removed. It is still early but there could be some preseason bass opportunities. Garden Bay was still iced over. Marquette: Had slow fishing. Some were still targeting coho near the “bubblers” when using both artificial lures and cut bait. Those trolling spoons had no luck. Some steelhead were caught in the Carp River and the Chocolay River but cold weather has slowed the bite. Au Train: Had no reports and no anglers as the dock is not in at the launch. With the return of winter weather, it is unknown when it might be put in. The Rock River had a few anglers but no fish were caught. Munising: The bay is ice free except for skim ice in the morning and some ice floes throughout the bay. The city public launch is open with one dock in. Prior to the cold front, anglers were mainly trolling but catch rates for coho were slow and no steelhead were reported. Those fishing off the Anna River dock and boat anglers near the mouth did catch some splake, menominee or whitefish. Grand Marais: Before the cold snap, boat anglers did well trolling for coho in the harbor, along the breakwall and near the mouth of the Sucker River when the wind permits. A couple steelhead were caught. Some were pier fishing. There was no ice on the first section of the pier but there was still a large wall of ice near the lighthouse and on the rocks. Anglers were targeting coho and lake whitefish with a single egg or when casting spoons. There was very little activity at the Sucker River. The Two Hearted River was producing some steelhead. The river mouth is good for coho on good weather days or when there is a south wind. Cedarville and Hessel: The Cedarville boat launch was still iced in. At Hessel, anglers were splake fishing outside the pier but catch rates were spotty. Most were using a combination of natural baits including smelt, spawn, minnows and crawlers under a bobber. St. Ignace: The docks are not in at the launch so there has been little to no fishing activity. There are some steelhead being caught in the rivers, but the cold weather slowed the bite. No smelt to report, water temperatures are too cold. In St. Martin Bay, the new launch at the mouth of the Pine River is blocked by several large trees. Black River: In Mackinac County was producing some steelhead. Catch rates were slow but anglers were taking a few on spawn. Mackinaw City: The docks are not in and fishing activity on Lake Huron was between light and nonexistent. Cheboygan: The docks are blocking the launch near the marina but the dock is in at the city launch on the river. Fishing pressure on Lake Huron is light but those fishing the Cheboygan River caught steelhead on spawn and butter worms. Ocqueoc River: Had a good number of steelhead but the bite slowed with the colder weather. Rogers City: The docks are in but no facilities are open yet. The weather remains cold and snowy. When temperatures warm up casting from the wall is possible. Look for steelhead, lake trout or Atlantic salmon. Bright colored spoons will probably be more affective as the water is still turbid. Presque Isle: Had no docks in at the ramp and none of the facilities were open yet. Alpena: The ice was off the Alpena Boat Harbor and the docks are in at the ramp on the river which means good access to the bay for boat anglers. With lake trout season open and walleyes returning to Thunder Bay after spawning, fishing should pick up quickly when water temperatures warm up. Another option for accessing Thunder Bay is the small-boat ramp at the Devil River in Ossineke. The ramp gives access to the southern end of Thunder Bay and its excellent walleye fishery. Thunder Bay River: Still had some steelhead hitting on spawn. Au Sable River: Water levels were high and muddy. The better fishing was up near the dam where the water was a little cleaner. Tawas: Only one lake trout and one walleye were caught off the pier by those still-fishing with grey shiners. Boat anglers reported the water as stirred up and very dirty. Only one walleye was caught. Tawas River: A few suckers were taken however the average was one sucker per hour of fishing. Au Gres: Boat anglers are catching walleye off Point Lookout. Most of the fish were large, spawned out females so it sounds like the post-spawn phase is starting. Detroit River: Walleye fishing has been hit-or-miss. Those jigging in the lower and mid-sections caught fish depending on wind direction and run-off. Oakland County Cass and Union Lake have seen minimal fishing effort because of the cold weather. Those casting blade baits, and lipless crank baits in deeper water were catching some bass. Catch rates for crappie and other panfish were slow. Lake St. Clair: Once again, there is not much to report. Skim ice was forming in the canals and the docks were iced over with the cold nights. The lake continues to be muddy from all the wind and run-off. Clinton River: Had some reports of a couple steelhead being caught. Lexington: Had a few boats going out and they caught a couple coho in 17 to 20 feet. The water along the outside of the Thumb was very muddy. One boat went out to 80 feet looking for cleaner water but did not find any. Saginaw Bay: All the rain, snow and ice shut fishing down area-wide. The bay has been very turbid. All of the area rivers are terribly high, if not actually over flood stage, and very muddy. There was little to no activity at Eagle Bay Marina, near the Pine River and Palmer Road. Reports have come in that post-spawn walleye are starting to be caught off the river mouths, but finding clean water will be a problem. A few perch were caught from the cut at Finn Road but shut right down after the rain. Mud Creek was spotty for perch. Sebewaing and Caseville had almost no fishing activity. St. Joseph: Fishing pressure is very low due to the very poor weather. St. Joseph River: Is high and muddy after all the rain. South Haven: Had very low fishing pressure. There seems to be a few brown trout around. Spawn or skein fished on the bottom should work. Holland: Pier anglers were out targeting steelhead and brown trout. Grand Haven: Pier and boat anglers reported slow action for steelhead and brown trout. Nearshore water clarity is poor due to recent rains. Grand River at Grand Rapids: Was producing a good number of steelhead however high water levels will make fishing more difficult. Grand River at Lansing: Few anglers have been out because of the cold weather. Those making an attempt did manage to catch the occasional steelhead. A couple suckers were caught on crawlers, leaf worms or red worms. Rogue River: Was still producing a good number of steelhead in the lower river. Muskegon: Pier anglers caught steelhead and brown trout on spawn. Muskegon River: Water levels are high and muddy. Steelhead were there but the bite slowed with the cold spell. Whitehall: Pier anglers caught some steelhead and the occasional brown trout.